Glass and open shelf cabinets are beautiful on their own, but when purchasing one, it’s important to keep in mind what will be stored inside. Because the styling of a cabinet is as important as the cabinet piece itself. Are you buying the cabinet with the intent to display items such as family heirlooms or fine china? If you are buying a cabinet for the sole purpose of storing household items, then a cabinet with panel doors may be a better option. In a prior post, I talked about the key elements needed to style a coffee table (HERE). Once you understand the key concepts, it’s not so daunting. The same holds true for a glass/china cabinet or open shelves. A few tips to follow and you’re golden. Before you start styling, take inventory of your items and adjust your shelving to fit your largest pieces. Start with a focal point and element, this will usually be your largest piece. I painted this vase white, specifically for the purpose of using it to style this cabinet. Read that post (HERE) on painting everyday items. Place plates and platters in the back. Many cabinets have grooves to secure your plates, or you can use china easels (HERE) to stabilize your plates. Add items in front of the plates, and avoid placing your important pieces in the center. Symmetry is boring, place your important pieces on one side of the cabinet. Create height and visual interest by adding items on top of items. In this picture, I have artificial flowers in a vase, in a bowl. Layering is very important, use differing heights of items, tall and short, wide and narrow. I painted these candlesticks white, you can read that post (HERE). This picture shows more layering, a bowl on top of plates and a candle inside the bowl. Stack cups and saucers on top of each other. Cups and saucers are great items to use in a cabinet, and I would avoid showcasing glasses and crystal, as they typically don’t show well through glass panes. Another shelf, group like items together, I placed my appetizer platters on the same shelf. I used the soft paperback books I painted, tied in a rope and placed inside a bowl for visual interest. You can read that post (HERE). Different shapes and sizes, and layer, layer, layer. The third shelf, same concepts. Here I used the hardback books I painted, and placed them inside a wood planter box. All the items I used for the cabinet are items I already had in my house. With the black backdrop of the cabinet, I chose mostly white items to display. Once you have everything the way you want, step back and take a look at your work. Chances are, a little tweaking may be necessary. If you go digging though boxes in your house, you may be surprised at what you find. The last tip I have – use your display items! 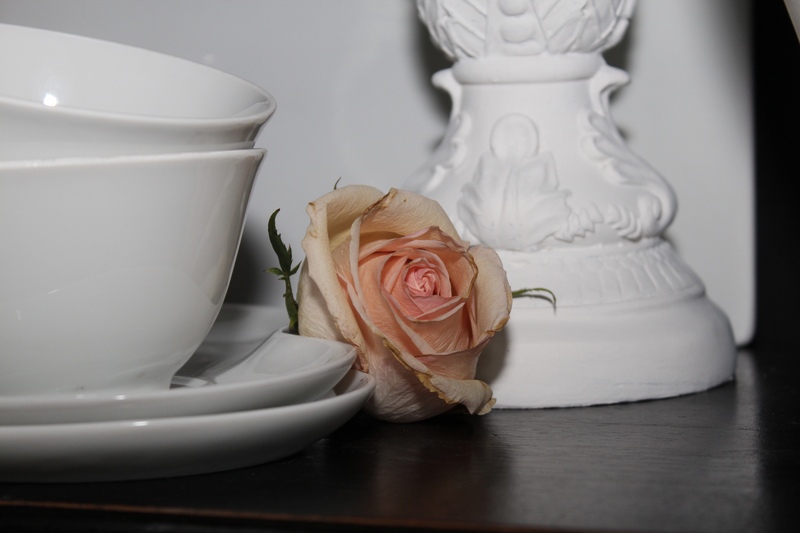 If you have beautiful china you received on your wedding day, bring it out and use it. Create a beautiful tablescape with flowers and candles and enjoy your pieces. Thanks for stopping in and I hope these tips are helpful to you in styling your cabinet! I liked all your good ideas!!! Home is a sweet place to discover such beautiful creative ideas helps home to make it more beautiful and sweet. Love the classic stylish cabinet … keep posting love to visit again for new posts.